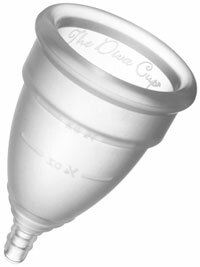 Though it is designed and manufactored in Canada, the Diva Cup is the most well known and popular menstrual cup in the US as well as in many other places in the world. In addition to buying it online, it is available in some grocery stores and pharmacies. While it’s not the first menstrual cup, in many ways it’s set the standard for some of the more recent entrants into the space. As a company, they are dedicated to excellence in menstrual care, environmental friendliness, quality production, and sustainability. It is made of the highest grade medical silicone and is free of latex, BPA, dyes (as well as many other questionable substances). The cup has a common shape but has a single ridge/lip high up on the cup which can make it more likely to stay in position during use. It has additional ridges toward the bottom and on the stem which can make it easier to remove (though can cause irritation for some women). In spite of the popularity of the cup, it is generally moderately priced in line with the cost of many of its brand named competitors. If you're new to menstrual cups and having trouble deciding which one to try, the DivaCup is a great middle-of-the-road option which works well for many women. In addition to FDA certification in the US, it is the only cup internationally certified to the ISO 123485.2003 level allowing it to be sold in Canada. In addition the the DivaCup, they also sell a DivaWash which is a gentle cleanser for the vaginal area.